Poster for Cripping the Arts: a three day festival of panel discussions, co-creative workshops, exhibitions and performances animating how Deaf and Disability arts and activism changes how we experience art and culture as well as the ways the sector contributes, and leads to, the achievements of disability rights and justice movements. Tangled Art + Disability occupies an important space in Toronto’s arts landscape, dedicated to enhancing opportunities for Deaf, Mad, and Disability-identified artists. Since 2003, it has produced annual festivals, gallery exhibitions, performances, and more, employing hundreds of artists and attracting audiences in the thousands from all parts of the community. With much of its revenues from private sector partners, Tangled Art + Disability works to meet its mandate to support Deaf, Mad and Disability-identified artists, to cultivate Deaf, Mad and Disability arts in Canada, and to enhance access to the arts for artists and audiences of all abilities. At the same time, the making of art by Deaf, Mad, and Disabled individuals disrupts the cultural myth that Deaf, Mad, and Disabled people cannot be creative and powerful agents of social change. 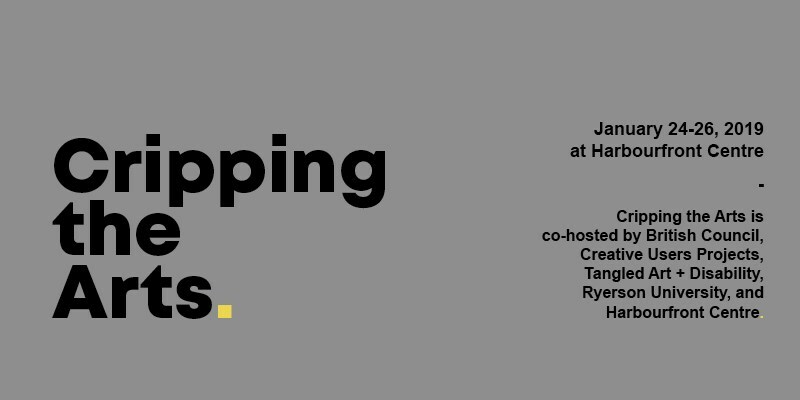 With the British Council, Creative Users Projects, Ryerson University, and Harbourfront Centre, Tangled Art + Disability will host its second “Cripping the Arts” from January 24 to 26 at Harbourfront Centre. Attendees will be treated to panel discussions, exhibitions, workshops, and performances from artists from across Canada and beyond. Each event will illuminate how the Disability Arts sector contributes and leads to the achievements of disability rights and justice movements. Click here for more information. Tangled Art + Disability is one of many registered charities on the Iler Campbell client list from the arts world and from the disability world but to our knowledge, the only one that combines these two important parts of the fabric of our community. We were proud to be retained by Tangled Art + Disability in 2018 to assist with some employment related matters. We will be here for them if and when other legal issues arise. ‹ Previous Post Iler Campbell in 2018 – look back with us! › Next Post When there’s a will, there is a way!